Jews Sure Have a Lot of New Years Celebrations! I would like to wish a happy New Year to all my friends and fellow students in Torah learning. I start our lessons off excited after a celebrating our emergence into the new civil year. Which gets me thinking, us religious Jews sure have a lot of New Year days. However in the Torah, we have one New Year identified for us. Here in this week’s parsha, we are told that the first of the heads of the months (“rosh chadashim”) will begin here (“rishon hu lachem l’chad’shai hashanah / to you it shall be the first of the months of the year”). From the month of Nissan, the month of liberation from Egypt and the celebrating of Passover, we are told to begin counting our months. This is one of the first mitzvot the Torah relays to us, one that is given even before the full revelation of the Torah at Sinai, it is for us to observe the months. Starting here, starting now. This year I found myself with great revelry celebrating the coming of the civil new year as it passed this week. 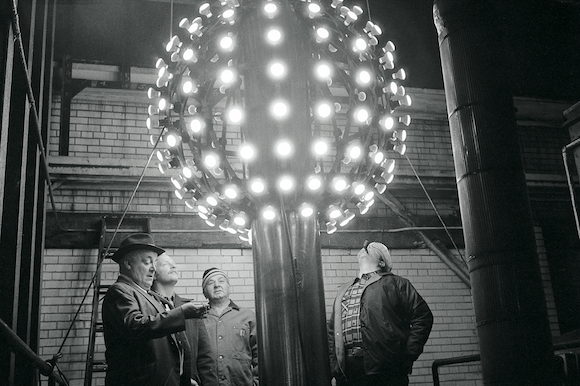 Generally I’ve been ambivalent about the Gregorian New Year, the reboot point set for the common culture. But this year I found so many legal and civil things coming to fruition with the New Year (the start of the Affordable Care Act, important new environmental ordinances, etc.) I just had to celebrate. Plus I get to leave a lot the financial and emotional stress of the last year behind me, and take a sigh of relief. I think that is what the observance of the New Year is about. It’s about having a chance to start over. To draw a line, and on the other side leave behind all the burdens of the that we need to leave to the past. Our Torah does reinforce this view, when the suffering of the children of Israel becomes too much G-d has them start over with a new year and challenges them to demand their freedom. I would hope that as we come into a new year we celebrate a new and better self, and then we work like mad to achieve that freedom. Though it may seem annoying to many other people that we have so many new years observances in out Jewish culture, and even more so as we observe the new years observed by our own local cultures though out the world. But I think it is beautiful that we have all these points to start again. And the truth is we can start over at any time, if we just choose to recognize it and celebrate it. Now you might have a lot of problems, you might be finding it hard to let go. You might be asking yourself how people can even ask you to celebrate, even though you still have all these hang ups? The truth is a new start always begins in misery and darkness. Our Torah tells us that the children of Israel, and both Moses and Aaron, were to observe the start of their new-found freedom while they were still in Egypt, a fact that is revealed at the start of this discussion about the activities of the exodus and Nissan in Exodus chapter 12. As the moon passes into the New Moon cycle Moses points to the sky and tells them that this is the sign of the start of these new months. But if we think about it, as he reveals the start of the months there is no moon in the sky to signal this new start. The sky and the land below is dark. New starts generally begin in darkness. This is truth that has been recognized to be so since the most ancient times. Whereas the first spring month of Aires has always been observed as the start of the actual year, and has been so for scientific and previously for legal purposes for as long as humans remember, when the sun is bright and triumphant over winter. The months conversely have been classically recognized to begin in darkness, at the New Moon. This understanding was often exploited by pagans and magical workers, who would begin the workings in the darkness of the month in hopes their spell would follow the cycle of the moon and grow stronger as the moon waxed bright in the heavens. The hope was that when the full moon came the problem would go away, or something dramatic would happen to change their fate. While we might frown upon and mock the superstitiousness and occultism of these people, in some ways our culture also has some touches of this type of observance. This earthy, cyclical mindset can be applied even to Judaism as well. And it is even mandated by the Torah, being reclaimed in a different fashion for a holy purpose. Immediately after we begin counting the months, Moses prescribes for the Hebrews the actions of preparing for Passover. They begin early in the 10th day of the month of Nissan, exactly 180-degrees opposite Yom Kippur – the day of atonement – which falls six months later on the 10th of Tishrei. As the moon has begun to grow to a crescent one is to prepare for their sacrifice, and then clear out all the chametz – the leavening in one’s home and possession. So that on the 14th of Nissan, on the full-moon of the month of Spring, we can observe the Passover Seder in order to celebrate the miracle of our freedom. We keep an ancient tradition, though with the thought in mind that we are working towards something good. We aren’t just engaging in wishful thinking, hoping that our struggle will be magically resolved for us. The Torah shows us that this process of acquiring freedom and redemption is an active process. There is more to this victory than showing up at the winners circle! Coming out of so many civil holidays, one might even get a bit annoyed that I bring up Pesach now. Because Passover is a lot of work! More so than any other time of the year. Most all of us are familiar with the difficulty of cleaning for the holiday. Literally everything in our house is inspected for chametz. It is this substance, leavening and its agents, that we seek to get rid of as they are representative of sin and pride in our lives. In that time of renewal and rebirth, we work harder than any other time of the year in order to achieve a new level of freedom and liberation in ourselves. Free from the negative “additives” that will ferment and sour in our lives. On the first Pesach, they started their process of deep introspection and inspection four days before. When they started the processes of keeping the pascal lamb. For four days they kept the animal for the sacrifice close by. Not just so they could proudly display the animal they chose for the mitzvah, but to also continuously inspect the unblemished nature of their sacrifice. Though the Torah says in this case we are to take the lamb on the fourth day, it does not necessarily mean that future sacrifices were mandated to be done on that day. Today in the modern age, we don’t have the ability to observe the mitzvah of the sacrifice so we don’t worry about the animal aspect. We instead focus more so on this cleaning away of the chametz, the sin and pride inside of us. And we begin this process much earlier, purely out of necessity as the complications of modern life has caused the fermentations of chametz to creep into the oddest place in our daily lives. For a new start, we need to commence with inspecting our sacrifice. For us religious Jews, we need to consider our service before G-d. Is our avodah pure, complete and unblemished? Our being and our homes, are they chametz-free, or are there some odd bits of sin and arrogance still riding along with us? Have we shelved some of this away unwittingly? Has some of this fallen into the cracks and is need of being removed from our lives? Freedom can start today if you want it. The Hebrews weren’t free yet when all this is spoken to them, yet they began to prepare their lives and ready themselves in an pure fashion. They did their part, with the understanding that G-d would reciprocate and do His part to aid their liberation. They corrected their lives, and got ready to walk into a new way of life. But it all really began with the children of Israel following G-d’s command to observe that they were starting over, to put the past behind and start counting from the here and now. Now even though the break for a new start might not be obvious right away, we need to realize and observe it as our new rosh – our new starting point. Like the new moon which is hidden, it might not be obvious right away and we need to be patient. Though the fact is our fresh start begins at the blackest part of the night, during the moonless nights of new moon. Renewal and redemption most often begin when its darkest in our lives. We need to prepare ourselves and do this hard work of self-inspection first. If we are committed to this then our passover will surely come, and we will be able to be free and unashamed as we celebrating in the full moonlight! You can decide to start over any time, my friends. You can start with a new year and new resolutions at any time. And it doesn’t need to be connected to any religion or culture. In our spiritual lives as Jews, we can also find many places to make a fresh start. Every month, we also have another starting point that we can easily mark; every time Rosh Chodesh comes. The truth is we can start over at any time. You don’t need to wait for another New Years day to come in order to get a chance to restart. Freedom starts today, if you recognize it and do something about it. Happy New Year, here’s to a fresh start! Just because Pesach– the Passover holiday– is over doesn’t mean this season ends. In the Talmud and classical Halachic works Nissan itself is considered an entire month dedicated only to joy and celebration; one big holiday free of mourning. There are a lot of ways to celebrate our freedom. One of the best was is to take advantage of that liberty and work towards our own enrichment. Nothing is more important to work on than our spiritual and emotional state. Coming out from under the effect what ever complications we might have stepped out of in this season should take first priority. There is no better investment we can make than in our own soul. Tikkun Chatzot: Do we say the Midnight Rite During Spring and Summer? At of course, in gearing up for Shavuot we again will need the prayers of the Shelosh Regalim, don’t forget to also get the Hallel and Rosh Chodesh packets. We are so grateful to have these resources hosted by our partners at the Open Siddur Project. You can find the link below. Last but not least, it is important for us to remember when studying the parsha according to the 1-year scheme t – the weekly Torah portion schedule for a single year – that in 2012 it differs outside of Israel from the one read inside Eretz Yisrael. Those who are inside Israel and only observe 1 day of Yom Tov already began Parshat Shemini last Shabbat. For everyone else b’chutz l’aretz – outside of Israel, in the Diaspora – we are just beginning it this week as last Shabbat was still Yom Tov. This schedule will remain ahead of us by one week until Shavuot of this year. With all that said, I want to commend everyone who worked so hard to make a kosher and liberating Pesach. I am proud of all the hard work people in our little learning community have invested in cleaning not just their homes, but their inner self with careful scrutiny and humility. I am even more thrilled to see how much joy and feeling of freedom we are all experiencing for it as well. Now on to Har Sinai! Do you need a siddur? This blog proudly cooperates with The Open Siddur Project. The project is a volunteer based organization dedicated to documenting and making the wealth of Jewish prayer and prayer resources available with free, redistributable licensing in electronic format and print formats. You can find my contributions of liturgy HERE. Find out how you can also be a part of this worthy cause! Sukkot is o ne of my favorite festivals of the year. It really is probably one of the most festive all times of entire Jewish Year for me. Being a long festival like Pesach, but without the dietary restrictions, this holiday for me and my friends is a big deal. When people ask me to explain what it’s like in the western calendar, Sukkot is probably closer to the celebration of Christmas for us. Except no 12 days of Christmas, its the 7 days of Sukkot. Everyone coming over to have meals in each others proudly decorated sukkot (booths), its a mitzvah to have a meal in a sukkah so most of us really go all out on the holiday dinner fare. The planning is obsessive. You know how Americans go do their Christmas shopping the day after Thanksgiving, us Jews got that same obsession to get the holidays started, we start building our sukkah the morning after Yom Kippur. One of the things though that I’ve often joked is “it has all the cheer, but without the fruitcake!” Fruitcake in the American tradition is so common during the Christmas season for non-Jews that it’s a staple, and sometimes even a cultural joke. People are so burnt out of the tradition of giving the stuff away you can even find inflatables that look like candied fruitcake with pecans, you know just to look good then re-gift it to the next person, so next year they can inflate and keep around to decorate the table with. Imagine my horror when a few weeks ago I’m reading through some non-Jewish bible commentaries, following up on some citations. All of a sudden I start finding these references by Christian bible commentators saying that the Levites invented fruitcake. In 1 Chronicles 16:3 it says that David had them give the people bread, a pan-cake and sweet-cake know as ashisha. For the most part is assumed to be some sort of fruitcake, as it has been understood since at least the middle-ages. Some scholars think it might have been some sort of cake mixed with raisins and dates, species of the area. I dunno, a good case can be made for this theory, but still it sounds hard to swallow! It might not be re-gifting sickening sweet fruitcake, but there is something about the holidays of Sukkot and Christiams that are also oddly similar; if you dare consider it. These holidays come accented with the flavor of etrogim. Whereas most non-Jews don’t know what a sukkah is, they are more likely to know what an etrog is – a citron fruit. It is a delightful citrus fruit that is candied and included as an essential part of most fruitcake recipes. But this fruit is a rare and precious fruit, so it almost never seen whole and fresh, except by Jews during Sukkot. 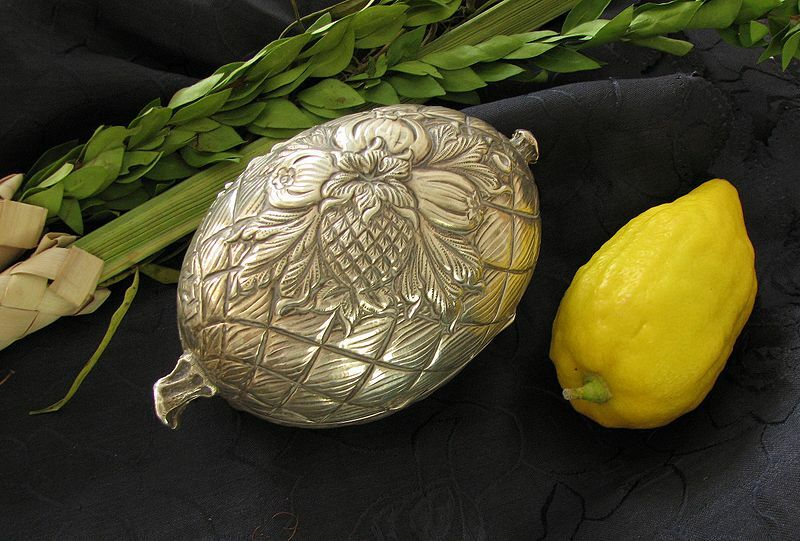 The etrog along with the lalav bundle of the native Israeli tree species are the symbols of Sukkot and this fall harvest. Because we should always select the best items for using in a mitzvah, people obsess over the quality of their etrogim and lulavim. They do it for a good reason, there are many requirements of Jewish law in order for them to be usable. For an etrog; it must be a pure breed, it must be disease free, no pests, the blossoming tip on the end must be intact, the stem must not damage the fruit; lots of requirements. But one thing above all for most of us, it must be beautiful. There are different minhagim (traditions) about what makes one beautiful in different Jewish communities, but we all insist on its beauty. 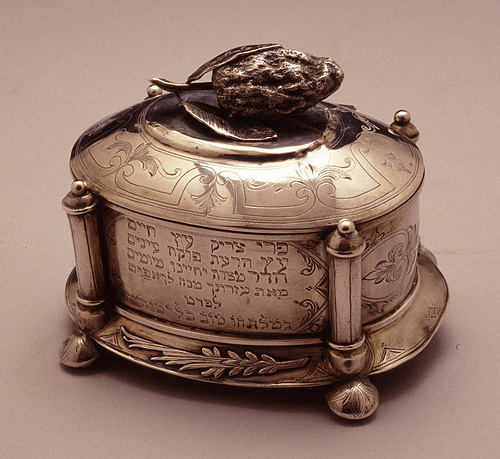 Aside from the beauty of doing a mitzvah, there is also well known Midrashim that suggest the etrog was the tree of knowledge, it was an etz hadar – a beautiful tree; based on this many reckon it was delightful to the eye and therefore we should seek an etrog that is also beautiful. Few etrogim live up to this scrutiny, I am told only about 1 in 10 survive to make the cut by the farmers in the end. The rest of them that are of eatable quality usually go into the hopper for being candied and dried. With so few etrogim being suitable but a demand for a couple million ritually acceptable etrogim each year, they can be quite expensive. When you go looking for your etrog for the holiday you know your gonna spend at least $25 dollars for a single fruit. You pick the finest one you can, and treat it like a treasure; many people having beautiful etrogim boxes or silver holders to protect and properly display it. Like I said, its a big deal. With etrogim being so expensive, naturally an entrepreneurial person would consider this and say “lets make some money, import a bunch of etrogim; we can make a killing.” Well, its not that simple (you know I’ve tried, ok!). The problem is not importing them, the problem is that there are never enough of them to go around no matter how hard a farmer tries. But how can this be? You see growing a etrog takes careful consideration. It’s a fruit that must be grown intentionally, with careful planning involved. It is not incidental at all. This is because the etrog is a pure species of citrus fruit. It is one of the only three pure species of citrus fruit, the fruits that are only indigenous to Asia; they are the Mandarin, the Pomelo and the Etrog (citron). All other species of citrus fruits from our navel oranges to our tangerines are just crosses of these species. Citrus fruit so easily cross pollinate that there are a myriad of varieties of citrus fruit. Those of you who have citrus trees in your backyard know this, if you have various kinds they often mix and your tree comes out covered with mutations of orange and lemons for example. This cross pollination is true for any species of citrus, but it especially so for these pure species. So pure are they that pollination from other species takes off drastically, more so that in other species that have been hardened by cross pollination. Pollination from afar can take hold and mutate the fruit until it not at all distinguishable, and surely not fit for proper use as food or in ritual. When I say mutate, I really mean it. Again people with many citrus trees know this, you have seen this in the form of volleyball sized fruit that taste horrible and are deformed. So the problem is that most people who live here in places like southern California, or even in most parts of Israel, where there are a lot of citrus fruits you cannot grow etrogim. You can certainly buy a tree, but it would not grow actual true citron fruit. There is so much pollen from the other trees it doesn’t stand a chance; pollen in the wind and that insects carry. It is more likely they will get pollinated by the other species of citrus, than get the lucky chance at getting pollinated by another etrog tree. So you see the problem is growing etrogim, we just can’t ever seem to grow enough. The odds are against them it seems. And that reminds me of the final reading of the Torah for Simchat Torah, which comes at the end of the Sukkot holiday; Parshat Vezot haBerachah. We learned through midrash that there were three tribes of Israel that at the time of the Exodus were pure Hebrews; the tribes of Revein, Shimon and Levi. Levi was called up to be priests, having set upon them laws of marriage purity more than even the normal Jew. Revein and Shimon, they suffered great losses because of their involvement in the sexual worship of Baal Peor. However, for Shimon it was worse. Early on in the conquest of Israel they had decreased to the point that they could not even be counted as an autonomous tribe. In time their existence as a people became obscured, their tribal heritage is no longer distinguishable in Israel. You know if we were talking about honey, another symbol of the holidays, cross pollination wouldn’t be that big of a deal. Though most people like mono-floral honey; orange blossom, clover, cherry blossom, etc. That’s because the taste is pretty consistent and intense. But when bees make honey from mixed species of pollen the color of honey often becomes cloudy, sometimes much darker, sometimes much harder, but the crossing makes the flavores indistinguishable, not as sweet to the taste, so bee keepers like to keep their bees around the sweet species of tree. Other pollen wont hurt the honey, but it won’t be as pleasing; its not what you really want, being a bit of this, and a bit of that. Because influences of herbage can change in open environments this year it can be good honey, next year not so good, it depends on what the bees have had to work with, and how much a certain pollen effects that batch. But for the etrog, it is devastating. The fruit will deform beyond recognition and clear identification sometimes. When this fruit reproduces its naturally going to want to reproduce mutated fruit by nature, even aside from pollination; there is no next year to try again for that offspring tree. So as we celebrating our high holidays let’s stop for a moment and consider how we are going to react during the gentile big holiday of Christmas; when it comes time for us to reject or re-gift that fruitcake they push our way with a smile. Don’t hurt their feelings, just tell them if your not going to eat it yourself because its not kosher. When they ask why, tell them because keeping kosher is just another way that Jews keep their distinct flavor. Even if they don’t know it, or appreciate it, us Jews like the etrog are a secret ingredient that no one really should have to do without. Is Parshat Acharei the Jewish Version of Xmas in July? The Frediker Rebbe was taught by his father, the Rebbe Rashab, who said that as we read through the parsha we should allow ourselves to experience the Torah. When we read about the creation we should live the wonder of creation, when we study of the rise and fall of man we should let ourselves experience that in our daily lives. Week by week living out the experiences of the Torah, for joy and sorrow. Practically, it means to look at the experiences our forebears and make it personal until we can empathize with the situation and see the truth of their experiences. This has been easy to do during our studies so far. Up until now we have be following the order of parashiot, all along the way I have been pointing out how thematically they have been been keeping in close step with the seasons. As we started approaching the month of Nissan we started reading about the work for erecting the Mishkan (the Tabernacle) and inaugurating it, which took place in this same month. But all of sudden we are thrown into discussing the death of Aharon’s sons again. Even more out of place in this first chapter, we start talking about the method of atonement that is used on Yom Kippur. Is the Torah Speaking Out of Order: Chronology, Thematic Progression, or Both? Now if I was a cynic I would look at this week and this parsha and say that not only is it a bad time, but this parsha has some good examples of why this type of approach by the Chassidim can be seen as fatuous, or at the very least adorable to the “true scholar” who knows that the parshas are just sections the Torah the rabbis divided up so we can get through it in a year. This cynic would point out that here we have our first verse saying “acharei mot shnei benei Aharon / after the death of Aaron’s two sons.” I would point out that it is not common in biblical Hebrew to use this word “acharei/after” in all the same ways that we use the word “after” in English. Acharei ordinarily means in relation to something, in the future sense; this happened after that. Here it appears that we could be backtracking in the time-line to the moments after the death of the two sons. Then we end up talking about Yom Kippur on the exact opposite end of the year. If the Torah skips around maybe we are just skipping around with different themes here and there throughout the Torah as many suggest. Maybe this is just the lot we have for this week, and it’s as simple as that. No we can say this is still following the same time-line, and besides the death of the two sons of Aharon was only a few days ago during the set-up of the Mishkan. But what about the odd mention to Yom Kippur, why now? I don’t want to take up too much time on it, but let’s look at something very shocking both in the time-line of the Torah reading, but also in the actual current Jewish calendar. Today I sit here writing this on the 8th day of Nissan, in our last parsha we read about the inauguration of the Mishkan which was finished on the 8th day of Nissan. So here we move into the new parsha, the Mishkan and the priests are sanctified and now its time for them to take up the work of the holy service. Ahh, now it becomes apparent to us if we walk in their footsteps, and look at the “to do list” of the day-planner for today. Before now no one had any reason to go into the sanctuary let alone behind the screen into the Holy of Hollies. But now the service was being handed over to the priests, and the presence of G-d dwelt there now so it became necessary to set up some safety measures so that the deaths they recently experiences in the household of the priests would not happen again. Thus we read in the second verse of our parsha that Moses is to tell Aharon that he is not to enter in beyond the screen at just any time, because if he does me could die. Then the chapter details how he is supposed to wash, dress, offer sacrifices, and perform the atonement rituals. Only then near the end of the chapter do we read that this whole ritual should take place “bachodesh hash’vii beasor l’chodesh / in the seventh month, on the tenth day of the month.” (v. 29) The date of atonement is brought up last because the same principals apply the rest of the year, this is the only method of entering into the most holy place; you cannot do it without purpose and you must not do it without readying yourself in this way. We’ll apparently we are still following the same time-line after all. The topic is apropos because the Mishkan is being handed over to the priests and they are being given a last briefing in “how to operate it correctly” so to speak. Final safety rules are being laid down to save from any mishaps. So we find that at least we are still following a line of logic within the theme of the text, great. And the close proximity of the narrative to the seasons is eerily close. But what do these two different season have in common with each other? Actually, it’s a lot. Both this month and the month of Yom Kippur possess a Jewish New Year, and holidays that are more similar than than at any other time of the year. They are like mirror images of each other. The Torah established the start of the year with the month of the Exodus. The name Nissan is never used. In fact even the siddur (the Hebrew prayerbook) doesn’t specify the name of this month, it just calls it “zman cheiruteinu / the season of our freedom”. This is the beginning of sacrifices regarding new moons as well, so this is the month we start counting from. In the biblical age months were counted numerically, from the month of Exodus. This is our spiritual year. 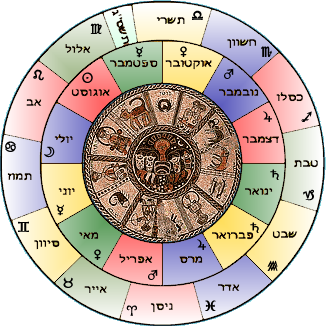 It was not until the second Temple period that we would see the names of the months assigned. Jews had been released from their captivity that began in the Babylonian exile and that ended in their return under the patronage of their Persian liberators. The Jewish people, who had adopted the Aramaic language of the near east kept the names of the months according to the common culture. The roots of the name of Tishrei for example come from the Akkadian language of Mesopotamia where the month was called “Tashritu,” or “Sherei” in Aramaic which means “to begin.” The month of Tishrei began to be regarded as the beginning of the civil year. Today it is the de-facto New Year we are all most familiar with. The difference between the two points of reference is like the difference between the calendar year and the “fiscal year.” But both starting months are regarded as the beginning of the year, but for different purposes of accounting. Nissan and Tishrei are exactly six months (180 degrees) opposite each other, yet they both have New Years in them. They both contain long, we ek-encompassing holidays, which required pilgrimages to worship at the Holy Temple in Jerusalem. Nissan bears the first of these pilgrimages, Pesach which begins on the full moon of spring harvest. Tishrei bears the last of these pilgrimages, Sukkot which corresponds with the full moon of the fall harvest. In Tishrei our main focus is repentance, which culminates in the observance of Yom Ha-Kippurim, the Day of Atonements on the “tenth day of the seventh month” (Leviticus 16:29) as we read in our parsha. Nissan culminates with observing Pesach. We read “beasor lachodesh hazeh veyikechu lachem ish seh… / on the tenth day of this month, a man shall bring a lamb.” (Exodus 12:3) The pascal lamb was to begin to be prepared on the tenth day of the month of Nissan. When you compare point by point, these months have a whole lot specifically in common with each other, so considering them in this parsha its not really a distraction. And besides that, like with the rest of the Torah, we can find common themes here that are good to consider at any time of the year. Maybe its not convenient to have to think about this right now, but that’s what the Torah give us to work with. The Torah doesn’t give us this parsha with its observance of Yom Kippur to further weigh us down. Nor do I think it’s a case of “Xmas in July,” yes one can suggest thinking about a holiday where one only fasts instead of putting in the backbreaking work for a kosher Pesach is probably a nice distraction, but I don’t think its that either. I believe the lesson in this parsha is that we need to find balance. These two starts of the year are opposite each other, yet they do not counter each other. They are two different tracks that parallel each, they work independently yet harmoniously to make one whole circuit. The “civil year” is just as important as our “spiritual year.” They compliment each other. I believe that this parsha gives us a hint, that we should seriously consider our moral and civil obligations that we will answer for in Tishrei at all times, even now in the season of spiritual heights and planning chaos. Now in the “season of our freedom” we need to start giving really good thought about how we are going to answer for what we’ve done with that freedom on the flip side!